Why do some Jewish women cover their hair? In Judaism, Orthodox women cover their hair beginning when they get married. How women cover their hair is a different story, and understanding the semantics of covering the hair versus covering the head is also an important aspect of the halakha (law) of covering. Covering finds its roots in the sotah, or suspected adulteress, the narrative of Numbers 5:11-22. These verses detail what happens when a man suspects his wife of adultery. And God spoke unto Moses, saying, "Speak to the children of Israel and say to them, 'If a man's wife goes astray and is unfaithful against him, and a man lie with her carnally and it is hidden from the eyes of her husband and she become unclean or impure​ (tameh) secretly, and there be no witnesses against her or she is caught, and the spirit of jealousy comes upon him and he is jealous of his wife and she is or if the spirit of jealousy comes upon him and he is jealous of her and she is not unclean or impure, then the husband will bring his wife to the Holy Priest and he will bring an offering for her, a tenth part of an ephah of barley meal, and he shall pour no oil upon it, nor put incense thereon, for it is a grain offering of jealousies, a grain offering of memorial, bringing for remembrance. And the Holy Priest will bring her near and set her before God and the Holy Priest will take holy water in an earthen vessel and of the dust that is on the floor from the offering the Holy Priest will put it into the water. The Holy Priest will set the woman before God and parah her hair and put grain offering of memorial in her hands, which is the grain offering of jealousy, and in the hand of the priest is to be the water of bitterness that brings a curse. And she will be put under oath by the Holy Priest, saying, "If no man has laid with you and you haven't become unclean or impure with another beside your husband, you will be immune from this water of bitterness. But if you have turned astray and are unclean or impure, the waters will cause you to waste away. And she will say amen, amen. In this portion of text, the suspected adulteress's hair is parah, which has many different meanings, including unbraided or untied. It can also mean let down, uncovered, or disheveled. In either case, the suspected adulteress's public image is altered by a change in the way her hair is bound on her head. The rabbis understood from this passage from the Torah, then, that head or hair covering was a law for the "daughters of Israel" (Sifrei Bamidbar 11) direct from God. 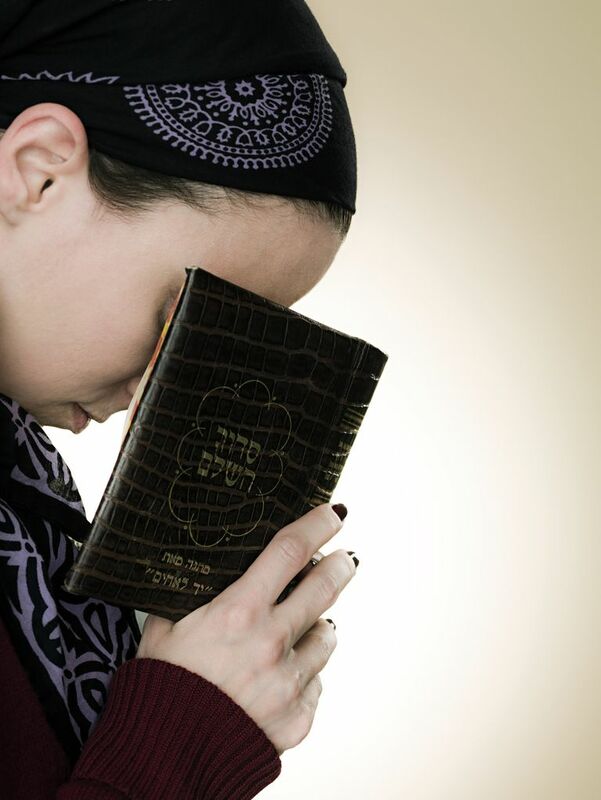 Unlike other religions, including Islam that have girls cover their hair before marriage, the rabbis gathered that the significance of this sotah portion means that hair and head covering only applied to married women. Many sages over time debated whether this ruling was Dat Moshe (Torah law) or Dat Yehudi, essentially a custom of the Jewish people (subject to region, familial customs, etc.) that has become law. Likewise, the lack of clarity over the semantics in the Torah make it difficult to understand the style or type of head or hair covering that was employed. The overwhelming and accepted opinion regarding head covering, however, states that the obligation to cover one's hair is immutable and not subject to change (Gemara Ketubot 72a-b), making it Dat Moshe, or a divine decree. Thus, a Torah-observant Jewish woman is required to cover her hair upon marriage. What that means, however, is something completely different. In the Torah, it says that the suspected adulteress's "hair" was parah. In the style of the rabbis, it's important to consider the following question: What is hair? In Judaism, head or hair covering is known as kisui rosh (key-sue-ee rowsh), which literally translates as covering the head. By this account, even if a woman shaves her head, she's still required to cover her head. Similarly, many women take this to mean that you only need to cover your head and not hair that falls away from the head. In Maimonides's (also known as Rambam) codification of law, he distinguishes between two types of uncovering: full and partial, with the former being a violation of Dat Moshe (Torah law). He essentially says that it is a direct Torah command for women to keep their hair from becoming exposed in public, and a custom of Jewish women to up that standard in the interest of modesty and maintain an intact covering on their heads at all times, including inside the home (Hilchot Ishut 24:12). Rambam says, then, that full covering is law and partial covering is custom. Ultimately, his point is that your hair should neither be let down [parah] nor exposed. In the Babylonian Talmud, a more lenient pattern is established in that minimal head covering is not acceptable in public, in the case of a woman going from her courtyard to another by way of an alley, it is sufficient and does not transgress Dat Yehudit, or custom-turned-law. The Jerusalem Talmud, on the other hand, insists on a minimal head covering in the courtyard and a complete one in an alley. Both the Babylonian and Jerusalem Talmud are concerned with "public spaces" in these rulings. Rabbi Shlomo ben Aderet, the Rashba, said that "hair which normally extends outside the kerchief and her husband is used to it" is not considered" sensual. In Talmudic times, the Maharam Alshakar said that it was permissible to allow some strands to dangle out the front (between the ear and forehead), despite the custom being to cover every last strand of a woman's hair. This ruling created what many Orthodox Jews understand as the rule of the tefach, or hand's breadth, of hair that allows some to have hair loose in the form of bangs. Rabbi Moshe Feinstein ruled in the 20th century that all married women must cover their hair in public and that they are obligated to cover every strand, with the exception of the tefach. He advocated complete covering as "proper," but that the revealing of a tefach was not in violation of Dat Yehudit. Many women cover with scarves known as a tichel (pronounced "tickle") or a mitpaha in Israel, while others choose to cover with a turban or hat. There are many who also choose to cover with a wig, known in the Jewish world as a sheitel (pronounced shay-tull). Wig-wearing became popular among non-Jews before it did among observant Jews. In France in the 16th century, wigs became popular as a fashion accessory for men and women, and rabbis rejected wigs as an option for Jews because it was inappropriate to emulate the "ways of the nations." Women, too, viewed it as a loophole to head covering. Wigs were embraced, begrudgingly, but women typically would cover their wigs with another type of head covering, such as a hat, as is the tradition in many religious and Hasidic communities today. Rabbi Menachem Mendel Schneerson, the late Lubavitcher Rebbe, believed that a wig was the best possible hair covering for a woman because it wasn't as easily removed as a scarf or hat. On the other hand, former Sephardi Chief Rabbi of Israel Ovadiah Yosef called wigs a "leprous plague," going so far as to say that "she who goes out with a wig, the law is as if she goes out with her head [uncovered]." "A married woman is allowed to expose her wig and there is no difference if its made from her own hair or her friends hair." In Hungarian, Galician, and Ukrainian Chassidic communities, married women customarily shave their heads before covering and shave each month before going to the mikvah. In Lithuania, Morocco, and Romania women did not cover their hair at all. From the Lithuanian community came the father of modern Orthodoxy, Rabbi Joseph Soloveitchik, who oddly never wrote down his opinions on hair covering and whose wife did not cover her hair at all. Curious About Judaism's Red Thread? Explore the Color!